On an earlier spring visit to Arran in late March, Niall McNair missed the ferry due to it leaving on British Summer Time instead of McNair-time, so he nipped back up the road to the Corrie boulder roof project. Right of Chris Graham's ealier left hand roof problem, this one was despatched before the next ferry. 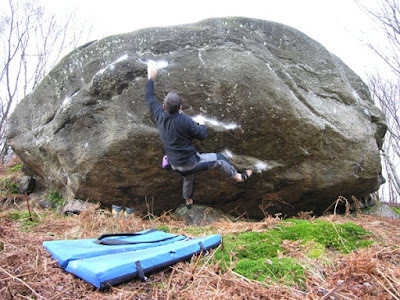 It goes at about Font 7b+ and is the hardest on Arran to date. He named it, rather drily, 'BST'. He also despatched the hanging arete by the fence on the giant Clach Dhruim a Charn at 7a+.